“You don’t create your life through action. It’s so great to see Esther, Jerry, and Abraham interacting with fellow creators on video at these workshops. You will normally get a sense of peace inside just listening to Abraham on audio. That peaceful feeling is amplified even more once you see them on video, and I’m sure many times more in person. I have been an Abraham student for 3 years now. Every year I gain more and more insight about life. I listen to the same material again and again. When time passed by, my experiences brought me to the new understanding of Abraham’s materials. Abraham makes the law of attraction so simple and very easy to understand. The core of the teaching is just to trust that the Universe can bring everything and anything you desire and your work is just being happy at where you are and eager for more of what you want. I see my life changing so much since I listened to Abraham. I get a wonderful job, get out of debt, get along with my family, and get an amazing relationship. Everything is falling into place. What keeps me being where I want to be is Abraham’s insightful words. As always, these Abraham DVD’s were amazing. I loved it. I loved this DVD set! It was validating and inspiring. In this set you get to listen to people ask questions and hear the answers by Esther/Abraham. 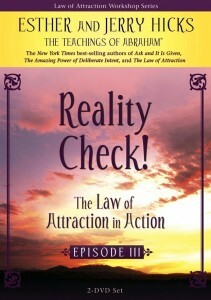 This gave me a much more in-depth understanding of how to put the Law of Attraction into practice. I wish I had been there at the conference! I find the Hicks work the most substantial source on the Law of Attraction. This DVD is such a gift, you can’t put a value on it. You learn something more each time you watch it. The power of Abraham’s words just send such energy right through me. Thank you for this beautiful awe-inspiring work! I haven’t been disappointed yet with any of their work & I don’t expect to either. It just keeps getting better & better. I was a bit shocked as I found the information to be very informative. The humour expressed by Abraham is both funny and an eye opener – who would think Divine Source would have such a funny side? Abraham answers all the questions with such clarity, giving several examples to explain even further. Total running time is just over 3 hours. The Q&A topics in Episode 3 provide brilliant insights into many common issues: how to recognise your vibrational stance in the moment; how to pay attention to thoughts and feelings with a view to improving your point of attraction; how we may be inadvertently pushing away rather than attracting what we want – be that freedom, money, love, the right job, and more. Many pearls to be found! Esther and Jerry Hicks are two fun-loving adventure-seekers, currently breathing-in huge lungful’s of joy as they figure-8 across the United States in their rock star monster bus, following the good weather, meeting friends along the way and enabling as many people as possible to visit with Abraham during all-day “Art of Allowing” Workshops.